When comparing flagships to cheaper mid-range smartphones, you might think to know exactly where compromises have likely been made. 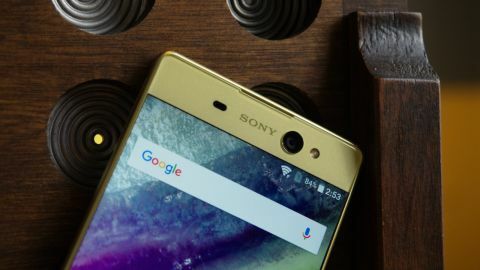 But, the Sony Xperia XA Ultra will test you harder than most. It’s a mid-range phone through and through, but it avoids the typical pitfalls made when distilling a flagship formula. You’ll find its 6-inch screen cradled in a solidly constructed mixture of glass and metal. The XA Ultra gives off nearly as much visual flair as its more expensive family members, like the Sony Xperia X Performance and Sony Xperia XZ. Surprisingly, it also squeezes in one new feature that we haven’t seen elsewhere in Sony’s X-series of smartphones: the wide-eyed 16MP front-facing camera. Thankfully, it’s not just a number-pushing gimmick. It’s definitely worth checking out if you’re an avid user of Snapchat or any other video chat app. Of course, it’s not without its share of minor faults. As with the Sony Xperia XA, we were disappointed that you won’t find beloved Xperia features here, like a waterproof design or fingerprint sensor. But, at $300 (£299), the Sony Xperia XA Ultra is a very strong effort, one that pushes the boundaries of what we should expect out of mid-range competitors, and Sony itself, moving forward. Sony’s selfie-focused XA Ultra is available now in the US and UK. We’ve requested info regarding global availability and pricing, and will update this review when we hear back. In the US, this device retails online for $300 – just $100 above the smaller Sony Xperia XA. Though, since we’re in the midst of holiday deals, we’ve seen it going as low as $230. Keep your eye out for more discounts as time goes on. Like the rest of Sony’s recent lineup, you won’t find this phone at your local carrier. It’s available unlocked only, and as such, you can activate it on the GSM-compatible carrier of your choosing. In the US, that means it’s limited to networks like AT&T and T-Mobile, and unfortunately, means it won’t work for those on CDMA carriers, like Verizon or Sprint. The design of the Sony Xperia XA Ultra follows closely in line with that of other X-series phones, which is to say that there’s nothing new here that you haven’t already seen used in the Sony Xperia XA. It’s just a bigger version, with a blown-out front-facing camera. But, at that, it’s still worthy of discussion. Sony’s mid-range smartphone weighs a hefty 201 grams and measures in at 162.5 x 78.7 x 7.6mm. The XA Ultra isn’t the thinnest or the lightest of the budget smartphones out there. But, for some, the design will strike all of the right chords. The XA Ultra is as easy on the eye as it is the hand, and its smooth, rounded corners of the device complement the nearly bezel-free screen. The combination of its glossy, speckled front and matte-textured back come together nicely on our lime green review unit. The main attraction of the front of the XA Ultra is obviously its 6-inch, 1080p IPS LCD display. You’ll find but the slightest bit of bezel to each of its sides – and effect that gives it an edgy, futuristic look. Look up a little and you’re greeted with the large front-facing camera lens, along with the ambient light sensor, flash, and speaker near the top of the phone. Its bottom bezel is thinner by comparison, too thin for capacitive buttons. Instead, it delegates those to the spacious touchscreen. The XA Ultra plays host to the usual set of features around its sides. As is tradition with Sony-branded phones of late, the SIM and microSD tray is on the left, and the buttons are on the right side. Unlike the other X-series phones, credit goes to Sony for making the volume rocker easy to reach on this phone. It’s right next to the circular power button, as it should have been on its other phones. It was awkwardly placed near the bottom corner on the Sony Xperia X Compact and Sony Xperia X Performance, making it all-too-easy to drop these expensive phones. Near the bottom edge is the shutter button, which can be held during sleep state to boot straight into the camera app. Bummer about the lack of a fingerprint sensor, though. Its back is barren, aside from the rear-facing camera sensor, flash, and some light branding. Its matte-textured metal back means that your fingerprints won’t cling, making the sterling look of this phone ring true even after some time.